A couple of club members have made comment about not seeing me on a bike lately. Well I’m hoping to put an end to those rumors with a bang. Yep, that’s right once again I’ll be cycling the 880 miles of the ‘end 2 end’. Due to popular demand it will be completed the easy way; top down. David Law, Harry Crampton and I will set off from John O’Groats on Sunday 21st September and hope to reach Lands End the following Saturday. Once again it seems only right to try and raise some money along the way and due to a couple of personal reasons we will be donating any money to the BreakThrough Breast Cancer Charity. 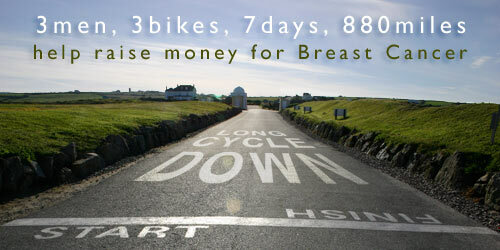 I’m sure will agree it is a worthy cause so please feel free to spare a few pennies. Many thanks Roger for stepping in to cover our MIA marshal!